About three to five percent of colorectal cancers are believed to be caused by mutations in the MLH1, MSH2, MSH6 , PMS2 or EPCAM genes.1 When a patient carries a mutation in any of these genes, he/she has a condition called Lynch syndrome also known as Hereditary Non-polyposis Colorectal Cancer (HNPCC) syndrome . Some patients with Lynch syndrome may also develop sebaceous adenomas, noncancerous tumors of the sebaceous glands. 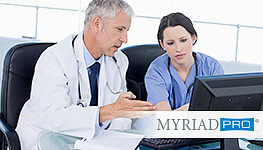 Myriad offers genetic testing to determine whether your patient is a carrier of any of the genetic mutations associated with Lynch syndrome. If a patient’s personal or family history indicates that he/she may be at an increased risk for Lynch syndrome, genetic test results provide the most accurate way to assess that patient’s cancer risk. Knowing the risk can help you and your patient make better and more informed decisions before the onset of cancer or before a second cancer has had a chance to develop. Since some polyposis syndromes like AFAP or MAP may not present with a significant personal/family history of colon cancer or colon polyps, genetic testing may be a useful tool to identify at risk individuals.4,5 Myriad offers genetic testing to determine whether your patient is a carrier of any of the genetic mutations associated with Lynch syndrome. Counseling for mutation carriers and their family members on the underlying cause of the cancer or adenomas. Increased surveillance and other interventions specifically for individuals with the APC or MYH gene mutations. Improved patient compliance through the use of tailored screening recommendations and preventive measures. Significantly improved outcomes and reduced medical costs through early diagnosis and treatment of cancer. **Lynch-associated cancers include colon, endometrial, gastric, ovarian, urinary tract, renal/pelvic, biliary tract, small bowel, pancreatic, brain and sebaceous adenomas. 1. Giardiello FM, et al. Guidelines on Genetic Evaluation and Management of Lynch Syndrome: A Consensus Statement by the US Multi-Society Task Force on Colorectal Cancer. Am J Gastroenterol. 2014 109:1159-79. PMID:25070057. 2. Burt R, Neklason DW. 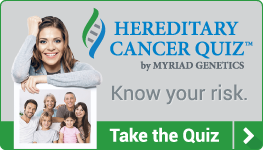 Genetic testing for inherited colon cancer. Gastroenterology 2005 May;128(6):1696-716. 3. Halford SE, et al. Germline mutations but not somatic changes at the MYH locus contribute to the pathogenesis of unselected colorectal cancers. Am J Pathol 2003;162(5):1545-8.